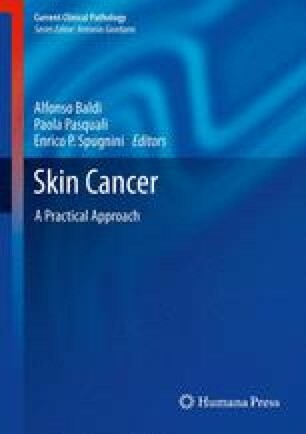 To improve the diagnosis of skin tumours, extensive research on new technologies has been carried out introducing real-time imaging methods as multiphoton laser tomography (MPT) associated to fluorescence lifetime imaging (FLIM). Multiphoton microscopy relies on the simultaneous absorption of two or more photons of low energy in the near-infrared spectrum, avoiding biological tissue damage that occurs with higher laser powers. With multiphoton microscopy, endogenous fluorophores, including NADH, NADPH and many others, can be efficiently excited. Since the technique is non-invasive and the laser illumination is harmless, in vivo examination by MPT/FLIM can be repeated on the same site without restrictions, enabling long-term studies of skin diseases. Horizontal and vertical optical sections give the possibility to study the tissue sample three-dimensionally with a subcellular spatial resolution. The MPT/FLIM technique has numerous applications in dermatology, being suitable for the study of many physiological and pathological conditions of the skin in vivo, on ex vivo samples and on cell cultures. The application of MPT/FLIM to the field of skin tumours provides imaging at a cellular and at an architectural level, although the field of view is at present limited to the exploration of a square area of 358 × 358 μm. Förster resonance energy transfer, is a mechanism describing energy transfer between two chromophores. Multiphoton laser microscopy with Fluorescence lifetime imaging. is a specialized optical microscope that relies on the simultaneous absorption of two or more photons of low energy in the near-infrared spectrum, avoiding biological tissue damage that occurs with higher laser powers. is a method for probing interfaces in atomic and molecular systems.